On December 28, a 2 1/2 year old male wolf crossed the border into California after a 1,000 mile journey south through Oregon. Wolf OR7, as he is called by Fish and Game, is the first wild wolf in the state in almost 100 years. A young wolf will leave his pack to search for a mate to start a new one in situations like too many wolves competing for game in a certain region. The new California wolf is a descendant of the 66 Canadian wolves who were relocated to Yellowstone in the mid 90’s. He is one of an estimated 1600 wolves who now roam free in the Rocky Mountain states, in the southwest, and in Oregon. The removal of wolves, or their reintroduction, reverberates up and down the food chain. By culling deer and elk, new wolf populations help restore vegetation along streambeds, improving habitat for songbirds, beavers and river otters. And by going after weak and old members of deer and elk populations, they help strengthen their stock. Wolves, in other words, are instinctive wilderness restoration specialists. Somewhere deep within us as well, is a fear of wolves that makes generations of children shiver at Little Red Riding Hood. That thrilled me when I read Jack London’s stores of wolves battling men. I didn’t know at the time that London’s stories were pure fiction. No such incidents ever happened. 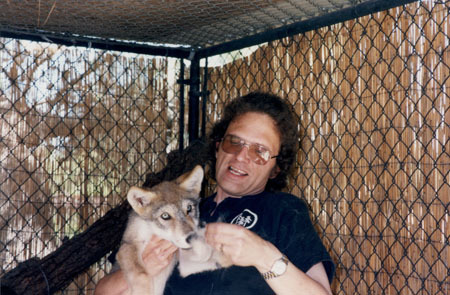 During the ’90’s, I volunteered at the Folsom City Zoo because I wanted to interact with the wild canines – the wolves and foxes and coyotes. 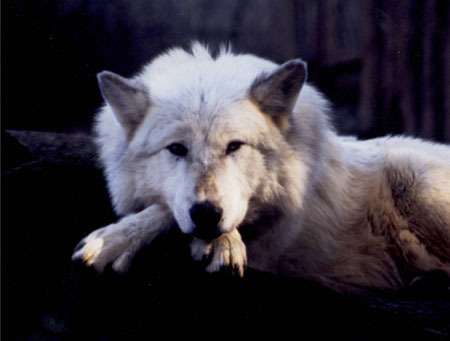 The book, and the movie made of it in 1983, deserve much of the credit for reversing public attitudes toward the wolf, and allowing reintroduction to happen at all. Gandhi said the character of a nation is revealed in the way it treats its animals. Let’s hope the way we treat OR7 reveals something compassionate, wise, and generous in us. This entry was posted in Animals, Current Events, Nature, News, Science and tagged Animals, current events, Nature, News, Science. Bookmark the permalink. I’m sure everyone can think of reasons why we got so out of balance. Let’s hope enough people are rethinking their attitudes to make a change!! Thanks for stopping by. 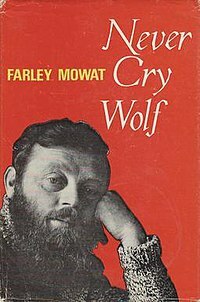 The movie Never Cry Wolf led me to the book, and while it’s been years since I thought of either of them, the lesson stuck: warnings of “dangerous to man” no longer generate my automatic assumption that an expert is speaking or that (s)he deserves my unhesitating deferment. How sad that Tim Hold can write that some locals want OR7 “shot on sight.” Why aren’t the ranchers waiting to call for his destruction until *after* first asking that he be carefully monitored? NIMBY with wolves. That sounds plausible, especially at this time, since Holt points out that a lone wolf is not likely to take on large hooved animals, even cows, by himself. I’m sure ranchers are concerned about more wolves moving in as neighbors. I remember the original Yellowstone reintroduction was contingent upon the promise of reimbursement for lost livestock. I don’t know what the status of that is now, but I have not heard anything suggesting there is a large scale problem, even in areas where the wolf population is larger. Thanks for such a great blog. I was thrilled to see the pictures of our new wolf. Yes, the ranchers near Yellowstone are feeling the effects of the growing wolf population – thinner cows. While the wolves don’t often kill a full grown cow they often chase them or the cows get frightened and run. Ranchers trying to fatten their beef for market are finding their cows putting on less weight which equals an loss of income per pound. My other concern is the average person who has a love affair with the wolf wanting a wolf-hybrid. People don’t understand that these animals are not pets and do not make good pets. As a result, many of them get dumped out in the forest to starve to death or get killed by cars when their owners realize they are not like the domestic dog. I am commited to my wolf hybrid but I also understand his needs and differences. He’s a lover and my five year old grand-nephew is his best friend, but I’m very careful when they are together and I’m very careful when we go out around other dogs or people. Anyone interested in Wolves and wolf hybrids should look up the rescue society, Never Cry Wolf. They are local, travel to schools and special events. They are also at Apple Hill in late summer and fall. The Folsom Zoo functions as a recuse and teaching zoo, and the unsuitability of wild animals and wolf hybrids is one of their themes. I haven’t been there in a while, but they always had a few hybrids that hadn’t worked out in people’s homes. By all reports they were more problematic to work with than the pure wolves – fewer keepers were certified to interact with them. The head zookeeper had two hybrids, but like you, lived in the country and was very aware of their special needs. Wonderful post. I was thrilled when I saw the article in the paper about the wolf and this has given me so much interesting information. I sure hope the wolves are allowed to thrive. When I think of wolves, though, the first story that comes to mind is the one from My Antonia about the bridal party trying to out-run the wolves. It doesn’t give a pretty picture of wolves and probably has contributed to the great fear of wolves we have. I remember a true account of guy in Canada who was in the woods when a pack of eight wolves started circling him. He thought he was a goner, but finally, when they just kept circling, he started to move through them and onto the trail for home. They let him pass but followed him all they way. Then he remembered he had 1/2 of a ham sandwich in his pack. When he put it on the trail that’s what they went for. That said, I think of all the stories of Russian wolves, from Peter and the Wolf to Dr. Zhivago, and I wonder if the behavior of those species is different. In any case, when walking in the woods these days, mountain lions are a greater threat than wolves are ever likely to be.